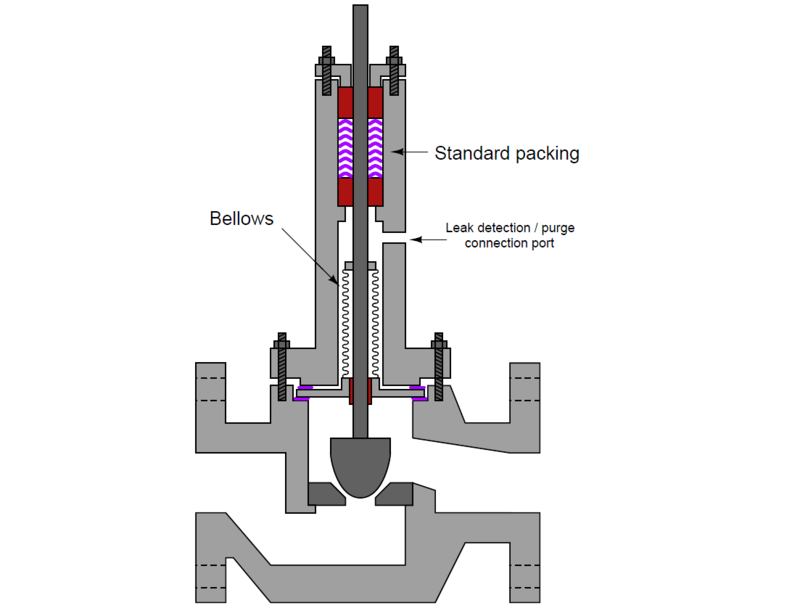 Bellows Seal Valve Working Principle | What is Bellow Sealed Valve ? A completely different approach to packing is a device called a bellows seal : an accordion-like metal tube fastened to the valve stem and to the bonnet, forming a leak-proof seal with negligible friction. The port on the extended bonnet serves as a point of connection for process fluid leak detection sensors, to sound an alarm and/or take action in the event of a ruptured bellows. The sensor may be as simple as a pressure switch, calibrated to “trip” at some modest pressure value below that of the normal process operating pressure. When the bellows seal breaks, the sensor will detect the leak and the standard packing assembly will maintain a reasonable seal until repairs are made on the valve. Bellows have a limited service life, which means the possibility of a rupture is likely. This is why a conventional packing assembly is always included in a bellows-equipped bonnet. The accordion-shaped bellows is contained and protected inside the thick metal tube visible in this photograph. One end of the bellows is welded to the valve stem, and the other end is welded to the protective tube. With the wide flange of the tube firmly clamped in the bonnet of the valve, a leak-free seal exists. What is Cage-guided Globe Valve ?